The Bosch VIDOS has been discontinued. No direct replacement is available. The Bosch VIDOS is a unique and powerful video surveillance and alarm management software product that enables security and surveillance professionals to perform sophisticated tasks with ease. Based on the intuitive graphical concept of site-maps, VIDOS puts the operator firmly in control of the world around him. VIDOS is fully customizable, allowing you to run your CCTV system the way you want to and keeping training down to a minimum. 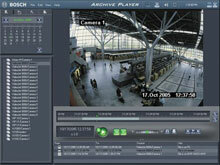 Additionally, CCTV keyboard integration enables the operator to control all devices, alarms and even sitemaps in the same way as controlling a conventional system.